Home > Home Page News > Back-to-School with 33 Kids! 07 Jan Back-to-School with 33 Kids! 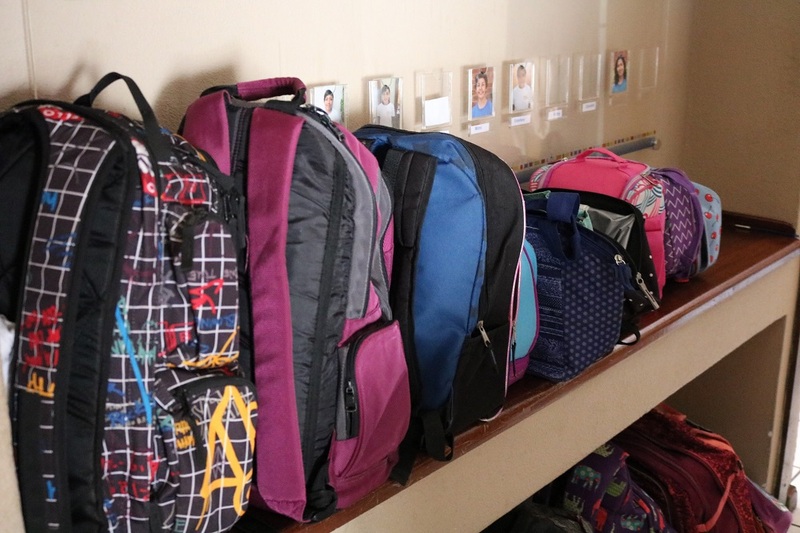 January means Back-to-School in Guatemala! Unlike in the United States, most schools in Guatemala run from January through October. While your kids are nearly halfway through their school year, ours are counting down the final days of their break. Individualized education is one of the core elements in our holistic care model. Giving children the opportunity to reach their potential means finding ways for them to learn and grow. This year, individualized education means 33 school-aged children in 6 different programs. Back-to-school preparation is time-consuming, especially when you’re shopping and planning for 33 kids between 4 years old and 18 years old. Thankfully Lucky and Yoselin, our teachers, have the experience needed to get everyone ready for the new school year. New school supplies, backpacks, and lunchboxes are starting to show up in our home. In the next week, Lucky’s classroom will become back-to-school headquarters as she sorts, labels, and packs supplies for each child. With so many children in school, our teachers are also busy preparing each child for the new school year. Isaias, Pablo, and Jimena are making big changes this year. After attending our local public school last year, Jimena will transfer to the Hosanna school this year for a more challenging experience. 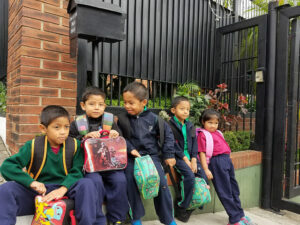 Isaias and Pablo are starting school for the first time. We’re excited to see these 2 little boys start school and make a world of new friends. One of our most important decisions is choosing the best schools for our kids. This year, that means we’ll have children in 4 private schools, 1 public school, and a home school program. The majority of our children attend 2 private Christian schools—Shaddai and Hossana. These schools offer challenging classes and opportunities for spiritual growth in a loving environment. Shaddai and Hossana have worked with us and our children for many years. They’ve become a community for our children with lifelong friends and teachers dedicated to helping them succeed. Some of our children have needs that are best met in non-traditional schools. We’ve partnered with schools specializing in educating children with attention and spectrum disorders. Verapaz has been especially helpful, offering specialized services accommodations that create environments where these children thrive. We’ve seen some of our children make huge advancements after just one year in this school. For Bryan, who graduates this year, Coeli has been instrumental in preparing him for the future. Through their vocational training program, he’s able to experience various trades and then focus on those he enjoys most. Working in a local restaurant has been one of his favorite experiences so far. He’ll graduate with a solid education and a head start on his future career. Occasionally, children aren’t ready to enter one of these private schools. Often, foster children are only with us temporarily and attend our local public school during their stay will also being tutored by our teachers. Others need more time and personal attention before heading to a regular school. This year 3 of our foster children will be attending our local public school and another foster child will be home schooled to give her extra attention before she returns to school. Watching our kids make bit changes in school and gain confidence reminds us how important education is in their lives. Cecilia shares a few updates from the last school year. “Mario made great changes during the year. He is a more independent child and has more fluid conversations with visual contact. In school, they commented that he learns easily, aspects that were reflected in his final grades.” Mario attends school at Hossana. “Yohana managed to integrate very well into a new school. At the beginning, math and English were challenging, but with her dedication and effort, she learned the necessary skills to conclude the year well.” Yohana attends school at Shaddai. “In the public school, Alejandra had difficulties learning successfully. During the year in her new school, she learned and found a passion for learning. 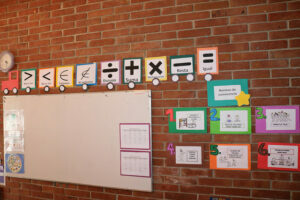 Verapaz School identified her great mathematics skills. She also now reads and understands more advanced readings.” Alejandra attends school at Verapaz. We believe a great education opens a world of opportunities for our children. You can help provide the individualized education our children need by becoming a monthly sponsor or giving a gift towards education today.